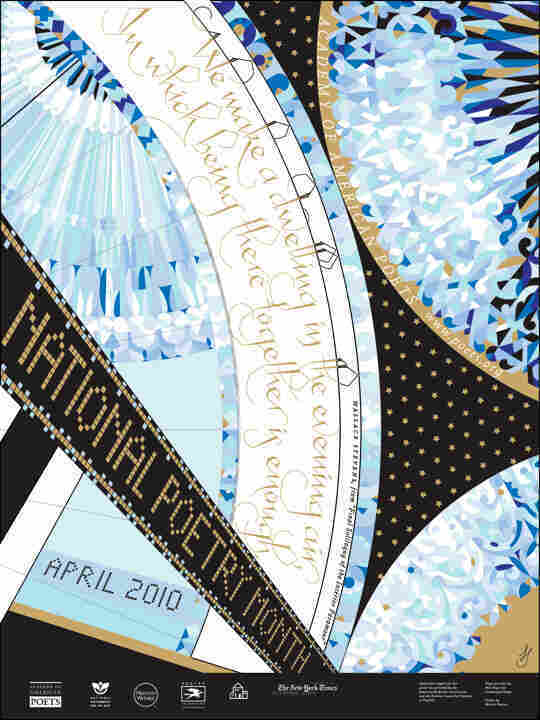 Character And Voice: Picks For National Poetry Month Librarian Nancy Pearl shares the work of a few of her best-loved poets. They include a former nun who wrote about Marilyn Monroe, a man who was left paralyzed after a bicycle accident, and writers who — despite the sometimes rigid requirements of their chosen form — find surprising, inventive ways to use words. I've discovered over my years of reading poems that voice is incredibly important to me. Whether it's the voice of an omniscient narrator or a narrator who's telling the story in the first person, I need to be captivated by the tone and language in order to get into the work and keep reading. I also most appreciate writers who use everyday language and straightforward diction, without any attempt to puzzle or frustrate the reader. But at the same time I want the poems to somehow say more than the words themselves do. I want the mystery and the glory of a poem to arise from the way the poet has put words together. I think that the poets I describe below all exemplify this kind of writing, which is why I like them so much. 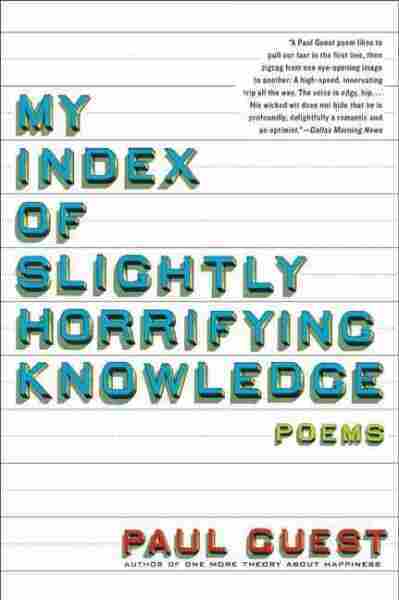 April, of course, is National Poetry Month, but let's begin with a novel, although one about poetry. 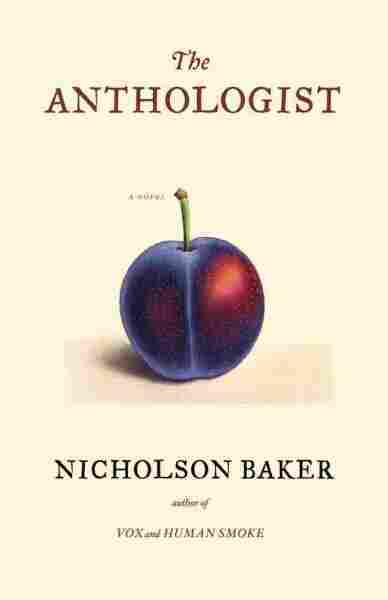 I found Nicholson Baker's The Anthologist a delight to read. The voice of narrator Paul Chowder immediately drew me in. He's a published (but not to such great acclaim) poet who has been hired to compile an anthology called Only Rhyme and to write its introduction as well. Read Madeline DeFrees' "To Marilyn Monroe Whose Favorite Color Was White" and hear DeFrees read the poem at a celebration of her 87th birthday. The introduction will give him a chance to expound on his belief that rhyme is necessary to poetry, that it, at one time, was a primary part of poetry now sadly lacking in the work of most modern poets. But Paul is totally blocked on writing this, an occurrence that has caused his longtime girlfriend to abandon him. (It seems to me that much of the book we're reading is the introduction Paul is unable to write.) It was fascinating to read Paul's explanations of meter and scansion, and especially his pet cause, the importance of rhyme in poetry. But what I really appreciate about Paul is that he loves two of the poets I adore. They're names you seldom if ever hear mentioned anymore, and you certainly don't find them anthologized in collections anymore: Sara Teasdale and Howard Moss. 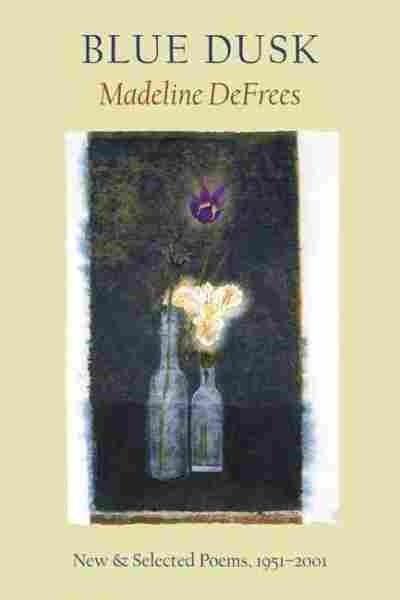 Whether Madeline DeFrees' subject is Ulysses S. Grant, Marilyn Monroe, Clare of Assisi or the sadness of a loved one leaving, her poems offer a myriad of pleasures. DeFrees joined a convent when she was 17, and remained in the order of the Sisters of the Holy Names of Jesus and Mary for the next 38 years, until she left in 1973. 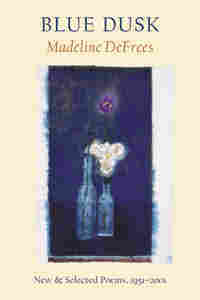 A good collection of her poetry can be found in Blue Dusk: New & Selected Poems, 1951-2001. She writes with a mixture of quiet humor, a deep awareness and appreciation of nature, love, loss and the blessings and pain of solitude. As with all good poetry, every word in every poem is important. One poem begins, "The day you were leaving," and each time I read it I am wonderstruck when I arrive at the last two lines, which play with the first in a way that makes you reconsider the whole of the poem. 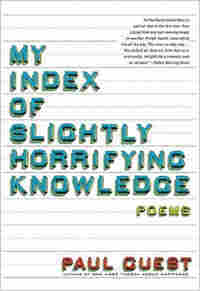 The poems in Paul Guest's My Index of Slightly Horrifying Knowledge are astounding and unforgettable. They all reflect -- either obviously or more subtly -- a central fact of the author's life: a bicycle accident at age 12 left him permanently paralyzed. The power of the poems comes from the accumulation of detail. As he explores his feelings at forever being set apart from those who are able to move their bodies at will, Guest's tone is colored by anger and bitterness, and frequently by a sadness so deep and pervasive that his poems are often literally painful to read. that diffident lover half naked in the dark. "Vaguely functional" -- wow, what a thing to say about yourself. Start with the first of the remarkable poems in this powerful, remarkable book, titled "User's Guide to Physical Debilitation." I don't think you'll be able to resist reading on. Read the complete text of Paul Guest's "User's Guide to Physical Debilitation." I have always loved the poetry of Donald Justice. The notebooks of favorite quotations, excerpts and poems that I've been keeping since my freshman year of college are filled with examples of his work. For me, reading through his Collected Poems is like meeting up with an old friend. Justice seemed to enjoy setting himself a challenge by writing a poem using a particularly difficult form, like a sestina or villanelle. One of the most difficult to do well is the pantoum. According to Wikipedia, the pantoum is composed of a series of quatrains; the second and fourth lines of each stanza are repeated as the first and third lines of the next. This pattern continues for any number of stanzas, except for the final stanza, which differs in the repeating pattern. The first and third lines of the last stanza are the second and fourth of the penultimate; the first line of the poem is the last line of the final stanza, and the third line of the first stanza is the second of the final." Doesn't sound at all easy, does it? 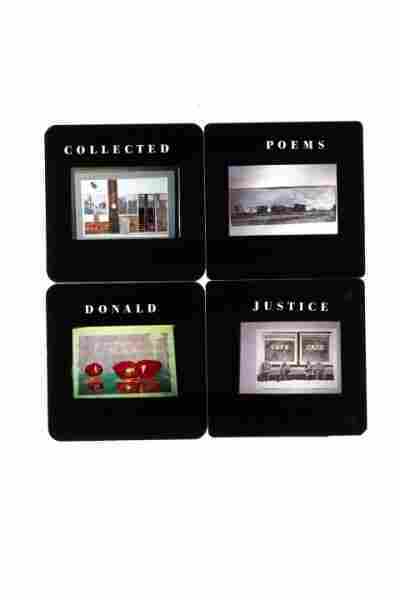 Take a look at Justice's "Pantoum of the Great Depression" to see a master at work. Louise Bogan's work was at one time so esteemed that she was appointed the fourth poet laureate to the Library of Congress in 1945 and was, for a time, poetry editor of The New Yorker, but she has been virtually forgotten since. Bogan's poems are mostly short lyrics that deal with women's lives from various aspects -- their strengths, their limitations, their desires, their dreams. 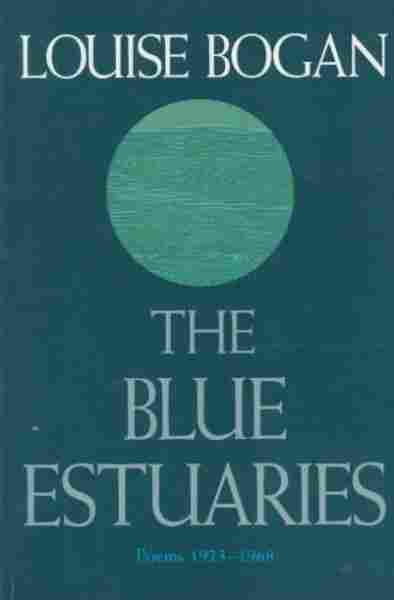 My favorite is called "Last Hill in a Vista," from The Blue Estuaries: Poems 1923-1968. What I most appreciate about Stafford's The Way It Is: New & Selected Poems is the way the narrator's personality comes through in each poem. After finishing them, I feel as though I know the speaker intimately: his thoughts, his hopes, his fears. Stafford sometimes uses rhyme in his poems, although not always, and the poems themselves seem deceptively easy to get until you read them two or three times, when the meanings behind the meaning begins to grow on you. "Reaching Out to Turn on a Light" is such a poem; the last stanza will take your breath away. 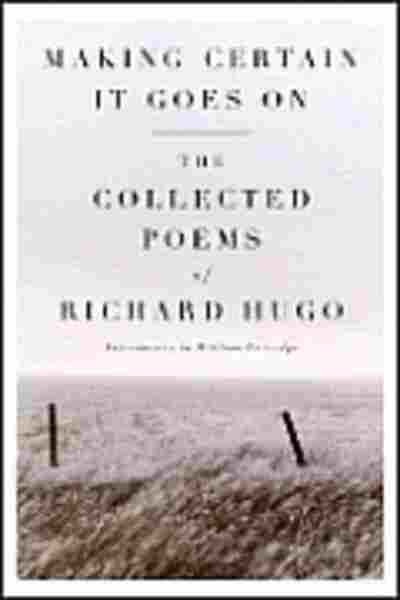 Making Certain It Goes On: The Collected Poems of Richard Hugo is filled with memorable lines and poems that I read and reread, and each time find something new to appreciate. Like Stafford's poetry, Hugo's is conversational and totally approachable. He writes about what it's like to live in this world, one filled with friendship, love and loss, and especially the places he has lived and loved. My favorite poem of Hugo's is "Degrees of Gray in Philipsburg," which begins: "You might come here Sunday on a whim./Say your life broke down. The last good kiss/you had was years ago." If you're looking for a way to get someone, child or adult, interested in reading poetry, you can't do better than introducing him or her (and yourself) to "Visions in Poetry," a new series of books from Kids Can Press. So far, there are seven books: Ernest Thayer's Casey at the Bat, Edward Lear's The Owl and the Pussycat, Alfred Lord Tennyson's The Lady of Shalott, Edgar Allen Poe's The Raven, Alfred Noyes' The Highwayman, Lewis Carroll's Jabberwocky, and My Letter to the World and Other Poems by Emily Dickinson. 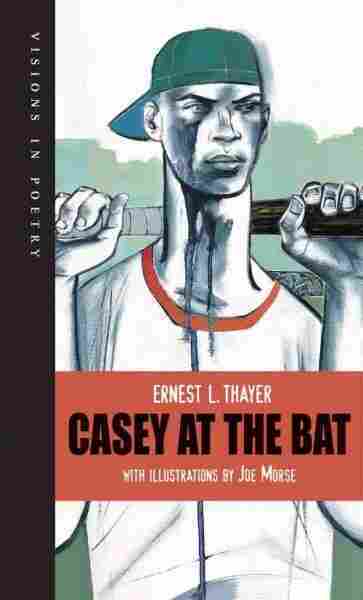 Each poem has been paired with illustrations from a contemporary artist: Stephane Jorisch's whimsical interpretation of Lear's poem; Genevieve Cote's colorfully delicate pictures accompanying Tennyson's poem; Joe Morse's thought-provoking rendition of Casey at the Bat, set against the background of an inner-city sandlot baseball game. Morse's illustrations are certainly not how I had ever pictured Casey and the Mudville 9, and to be honest, I was initially a bit put off by them. Yet the more I studied them and reread the poem, I realized that Morse had taken what is essentially a great example of light verse and given it a depth and resonance I could never have imagined. And, since I'm being so honest here, I was delighted to acquaint myself with Tennyson's well-known poem, The Lady of Shalott. Despite the fact that I was an English major (and was deep into the whole Camelot schtick -- and Malory's Le Morte d'Arthur -- all through college and beyond), and although I was familiar with several of the quotable lines of the poem (Agatha Christie used the first three words of the line "The mirror crack'd from side to side" as the title of one of her mysteries, for example), I had never actually read the poem itself. 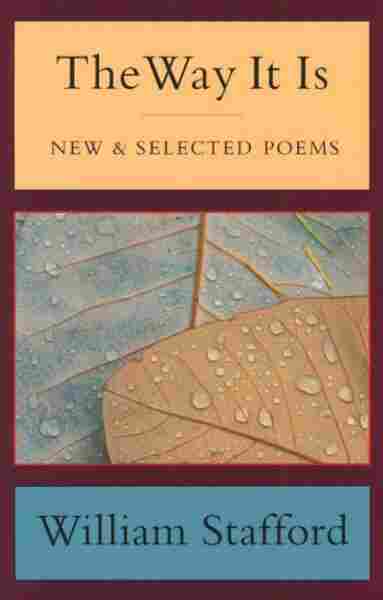 Each of the books has a useful section of notes on the poet and poem as well as a brief discussion of the artist's interpretation of the work. All in all, it's a well-conceived, finely executed series, aimed at readers 10 and up. Bravo to Kids Can Press. Audio courtesy of KUOW Public Radio in Seattle. went wrong: All About Eve. The Seven Year Itch. The Asphalt Jungle. Some Like It hot. How to Marry a Millionaire. towels. Chaste linens framing the parchment faces. From Blue Dusk: New & Selected Poems, 1951-2001 by Madeline DeFrees. Copyright 2001 by Madeline DeFrees. Reprinted by permission, Copper Canyon Press. All Rights Reserved. how to leave the house for the first time in two years. with apologies for the thoughtlessly thoughtless metaphor. caused by summer storms you once thought romantic. whatever it is, that to her seems equivalent to yours. of scaring small children by your presence alone. helplessness: it is a good idea to avoid that. above the knee due to pernicious gangrene. of every God damned thing you ever loved. From My Index of Slightly Horrifying Knowledge: Poems by Paul Guest. Copyright 2008 by Paul Guest. Reprinted by permission, Ecco, a division of HarperCollins. All Rights Reserved.